American cookies and Soviet cookies may share the same ingredients, but that’s where the similarities end. This piece is part of the Soviet Diet Cookbook, a blog about a modern Russian girl cooking Soviet food. To read more of the series, click here. This guest post was written by the blog's American editor. It was several months before I made a recipe from it. The first one I tried was semolina pudding with baked apples - a fairly simple choice, which was a good thing, because aside from the ingredients, the Book’s instructions are indeed vague. When determining what temperature was a “not too hot” oven and how long the apples should bake, it helped that I was already a fairly experienced home cook. I could imagine the half-baked concoctions a young housewife could have produced using it (pun sort of intended). The second recipe I made from the Book was actually on a card that the old Georgian chef had thrown in the Book at some point. It contained several pastry recipes from the “Young Guard” cookbook of 1987. I wouldn’t have become so intrigued by them if it hadn’t been for one recipe - Tvorog Cookies. Tvorog, as mentioned in this blog before, is a uniquely Russian milk product. It is a kind of curd cheese that often gets translated as cottage cheese, but is really nowhere near the same. The reason this recipe appealed to me is that I have found over the years that tvorog is an easy substitute for cream cheese (which Russians call “Philadelphia” and hasn’t been seen in stores here for some time). One of my favorite cookie recipes is for Cream Cheese Cookies and comes from my 1976 version of the Joy of Cooking. I was excited by the possibility that both the American and Soviet cookbooks could have a recipe for this kind of cookie. I skimmed the ingredients, noticed that they were almost entirely the same, and decided to give it a try. The instructions for the Soviet tvorog cookies began similarly to those for Cream Cheese Cookies - combine the tvorog and the butter. The Soviet recipe noted that this should be done with a wooden spoon. I figured this was because no one had an electric mixer. Then you added the flour to the mass and refrigerated it for 3-4 hours. 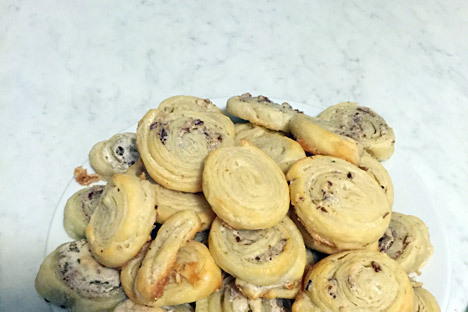 Cream cheese cookies were also refrigerated for 3-4 hours before baking, but you added the sugar to the dough first. “Oh well,” I thought, “I guess the sugar gets added in later.” and threw the dough in the fridge, not really thinking that it would be fairly difficult to mix sugar into dough that had set. “The whites?” I asked in surprise. “Check again.” I realize that her Russian is significantly better than mine, but it seemed like an odd instruction. If I were going to mix some part of an egg with sugar to make a cookie dough, I would have used the yolk. “Yes, the whites,” she confirmed. “Whip them, and then mix in the sugar until the mass is густно,” she said, not knowing quite how to translate the adjective for the consistency, which is kind of like viscous. And then she read on - something I hadn’t done before launching into this project. This was going to be way more trouble than I had been anticipating. Apparently a simple drop cookie was just not in the Soviet repertoire. But I shouldn’t have been surprised - the hardest thing to find in Moscow is a good American-style cookie. So I whipped the egg whites. I did it with a mixer, having decided that Soviets in the late 1980s must have had mixers after all, because I don’t think it’s possible to whip an egg white to the right consistency by hand, mixed in the sugar and got a густно mass. I rolled out the dough, spread on the sugar, and sprinkled it with crushed pecans instead of walnuts as the recipe called for because I’m a native Southerner and I just like them better. And I already had a bunch of chopped pecans. Then I rolled up the dough and the sugar mix went everywhere. Nevertheless, after 20 minutes in a “medium-hot” oven that I decided was probably 350 (175), I had dozens of cookies that could pass for tiny cinnamon rolls. The dough was light and they were just barely sweet. Not sweet enough for an American cookie, but definitely edible. And I’m sure if any Americans out there want to try them, cream cheese would work just fine. I might also add some cinnamon. The recipes from the Soviet Cook Book. Combine the tvorog and butter with a wooden spoon until well mixed. Stir in the flour. Form the dough into three separate balls and refrigerate 3-4 hours. Whip egg whites. Add sugar and stir until the mass is viscous. Roll the dough out into a square. Spread sugar mixture on the dough. Sprinkle with nuts. Roll the dough up and slice cookies no more than 1 cm in width. Bake in a medium-warm oven until done.